The current 240-member decision-making body is made up of representatives who are directly elected, with 24 representatives for each of Amherst’s 10 precincts. The group meets twice a year in sessions with a typical duration of 3-7 nights each. However, according to attendance records from the town clerk during the most recent fall session in 2017, 135 members attended all three meetings, and during the Spring session in 2017, only 111 members attended all five meetings. The representative-based town meeting structure in Amherst dates back to 1938. Before then, the municipality embraced the traditional New England model where any resident could go to meetings and vote. Some surrounding towns, like Hadley, still use this system. Under the new form of government that was approved on March 27, five districts will replace the 10 precincts. Amherst residents will each vote for two city councillors to represent their respective district, as well as three councillors who will be elected on a town-wide scale. The new City Council will meet at least once per month throughout the year. The process of making changes began in March 2016, when voters approved the creation of a Charter Commision, a group of nine citizens tasked with investigating the current governmental structure of the town. Over an 18 month period, the group collected information and compiled recommendations on the town’s government. The commission approved the Amherst Home Rule Charter in September 2017 which detailed the new legislative system by a vote of five to three with one abstention. As required by law, commission sent this charter, along with a final report evaluating it to the Select Board, the Department of Housing and Community Development and the Attorney General’s Office before it was included on the March 2018 ballot. 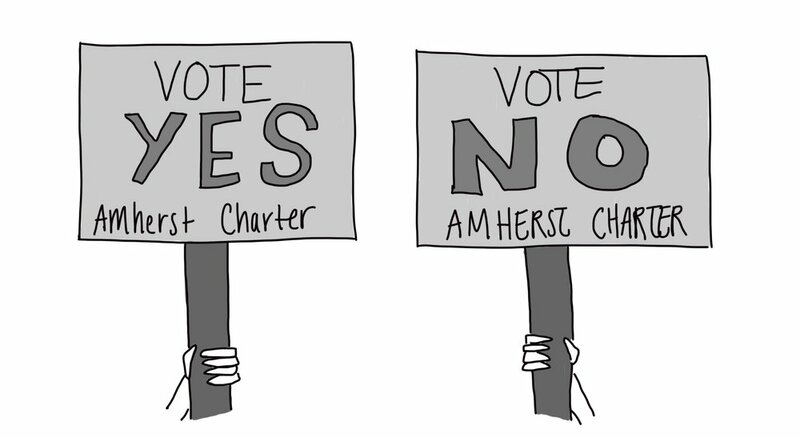 Amherst For All, a citizen grassroots organization which was in favor of the change in the town charter since the beginning, emphasized that Amherst has outgrown the 240 member system. “We need a form of government that can meet regularly, connect the dots on key issues and keep up with the challenges we face,” the group stated on its website. It noted that since 1938, Amherst’s population has grown by 600 percent and its budget by 1,400 percent. Christine Sherwood ’20 grew up in Amherst and went through its public school system all the way through high school. She believes that the city council model works better for the town. “There have been problems with town meeting in the past, and how much it actually represents the population of the town,” she explained. Specifically, she referred to an instance last fall where the town meeting voted on a tax override, which would have helped finance new elementary schools in place of existing, outdated ones. While the town voted in favor of the proposal through a referendum vote, the town meeting failed to approve the measure by a margin of two votes even after an appeal. In a town known for its progressive populace, the debate over its local government sparked an unusual amount of controversy. “I do think it was more politically charged than usual. People who didn’t usually participate that much in politics and campaigning were going to their neighbors and trying to get them to vote on their side,” Sherwood said. Flavia Cunha, a Spanish language instructor at Mount Holyoke, has lived in Amherst since August of 2008. Cunha does not feel that the town meeting system accurately represents Amherst constituents. “They vote according to their own convictions and interests, and not according to the will of their constituents,” she said.